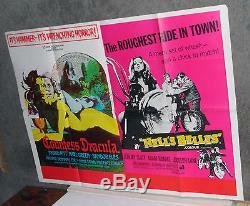 From the films "Countess Dracula/Hells Belles" released in 1971. This poster was sent to theatres to be displayed in the lobby to promote the film's engagement. The white line visible on some of the images is just reflective camera glare and isn't actually on the poster. The poster is folded which is the way they were sent out by the studios back then. The poster has a small bit of wear(see scan) and measures 30x40 inches. 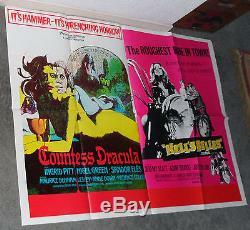 The item "COUNTESS DRACULA/HELL'S BELLES orig quad HAMMER movie poster INGRID PITT" is in sale since Wednesday, March 12, 2014. This item is in the category "Entertainment Memorabilia\Movie Memorabilia\Posters\Originals-United States\1970-79". The seller is "granadaposters" and is located in Dallas, Texas. This item can be shipped to North, South, or Latin America, all countries in Europe, all countries in continental Asia, Australia.